LinkedIn has transformed the concept of networking in today’s digital age. We still have that giant rolodex, or little black book of contacts sitting on our desk, but now it’s boxed inside a computer or smart phone, instantly searchable by location, industry, degrees of separation, and more. Microsoft’s 2016 purchase of the platform, including millions of users work history and demographic information, hasn’t slowed down the business and employment-oriented social networking service that operates via websites and mobile apps. In fact, it’s helping it grow. According to TechCrunch, LinkedIn maintains around 500 million members, with around 11 million open job listings. “At least 85 percent of the time, I search for a candidate’s profile on LinkedIn prior to submitting them to an open position,” said Nicole Sangid, Raleigh Delivery Manager for TSG. In fact, the same TechCrunch article attributed recruitment marketing with LinkedIn’s largest source of revenue. So, it’s important to have an updated presence on LinkedIn if you’re on the job market, or even thinking about switching careers. Members with a profile photo on LinkedIn can get up to 14 times more profile views than members without. Tips: Use a high-resolution camera, be mindful of your background and what you are wearing, no group pictures – just you. Make sure it’s a headshot, and smile! The text under your name on your profile is called your professional headline. It’s displayed in search results and can be separate from the title of your current position. You have 120 characters to say something that makes you stand out and gets the hiring manager to click your profile. Example: Recent college graduate hungry for a high-performing career in sales. 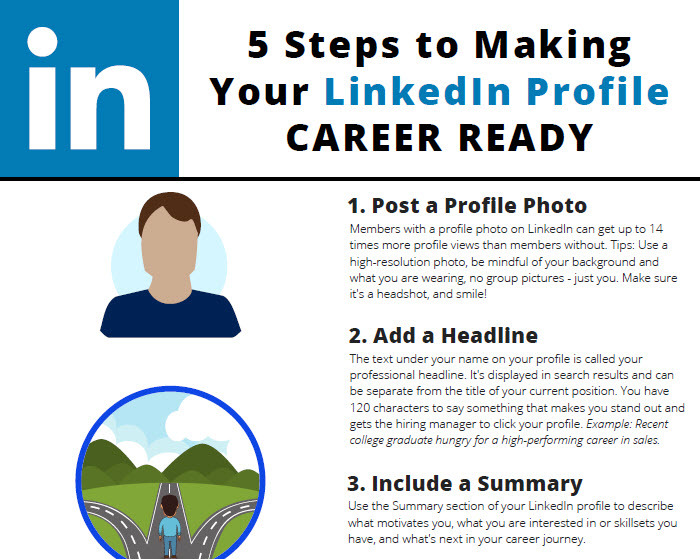 Use the Summary section of your LinkedIn profile to describe what motivates you, what you are interested in or skillsets you have, and what’s next in your career journey. List the jobs you’ve held, even if they were part-time or internships, along with what you accomplished at each position. You can also include work samples, links, photos, and videos to showcase your experience. Many recruiters and HR teams will search relevant tools and technologies when looking for candidates. You can enhance your profile by adding sections for things like recommendations, education and training, volunteering, patents, publications, skills, courses, honors & awards, languages, organizations, and more. Download our infographic for a visual overview of what to update. Search hundreds of job openings across the U.S. & Canada on our Career Search page.